Pocket Safety Cards provide each employee with a copy of the key safety meeting message. They are designed to fit in a wallet/purse and will ensure the safety message does not stop at the meeting. 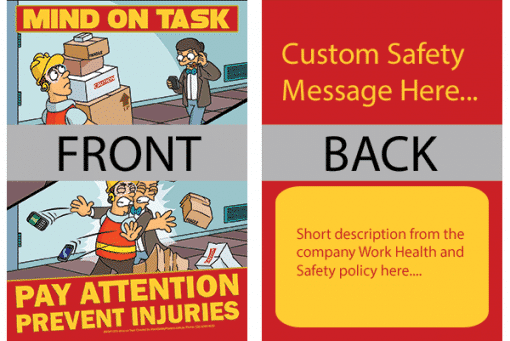 The front of the card has the matching poster of the monthly safety topic and the back of the card will have your custom safety message and a short description from your company Work Health and Safety policy or your company logo. To order add your custom text in the box provided and if you choose to add your logo, tick the add my logo option and we will email you with specifications on the file type. We will email you to confirm which safety topic you require once we receive the order. Custom text and the optional logo is all included in the price.